Dr Sanjiv Kandhari, having thirty nine years of experience in practice and teaching, is currently considered one of the best dermatologists not only in New Delhi, but also in India. 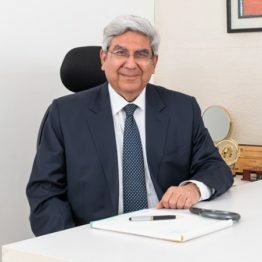 He completed his MD from the coveted All India Institute of Medical Sciences (AIIMS) and subsequently worked in various hospitals like Holy Family, St. Stephens, ESI, Northern–Railway , Batra Hospital, Escorts Heart Hospital, Vimhans and Orthonova apart from his private practice. Dr Sanjiv Kandhari has envisioned giving top service to his patients be it in general dermatology, aesthetic dermatology . At Dr Kandhari’s Clinic we follow this very motto. “Our patient comes before anything else, and we strive to give them the best possible service in terms of clinical diagnosis, treatment, services, comfort and hygiene”, says Dr Kandhari. Currently he is a reviewer for the Indian Journal of Dermatology, Venereology and Leprology and Indian Journal of Dermatology and has previously been the Associate editor of the National Journal for the Indian Association of Dermatologists, Venereologists, and Leprologists (1998-2003). Besides having written 2 books (The skin – A book on Dermatology and Monograph on sexually transmitted diseases), he has also contributed as an author and co-author to various articles in national and international journals and 7 textbooks. Dr Sanjiv takes keen interest in orations and has been an invited speaker at various national and international conferences. He is a member of special interest group (SIG) on urticaria who have formulated the Indian consensus guidelines on Urticaria 2012 and has been part of EAACI/ GALEN/ EDF/ WAO guidelines in management of urticaria and allergy in 2009. He was the chairman of the Derma Trends Scientific Advisory board. He has been the President (1992-93), Vice–President (1987-88) & Secretary (1986-87) of the Indian Association of Dermatology, Venereology &Leprosy (DSB) and the Joint Secretary of the Organizing Committee of the International Society of Dermatology Conference held at New Delhi 1994. He was the Chief Organizing Chairperson for the DERMACON AND SARC summit in 2005 and the president of AESTHETICS (2009 – 2016). Appointed the National Professor of Dermatology by the IMACGP for the year 1986-89, 90-92. Prestigious “Dr. Sardari Lal Memorial” Award in 2003 for distinguished service in the field of Skin & STD. Recipient of “Luminary-2005” Award, I.M.A., South Delhi Branch.Recipient of “Luminary-2005” Award, I.M.A., South Delhi Branch.Recipient of “Luminary-2005” Award, I.M.A., South Delhi Branch.